How to: 1. Apply a primer over the eyelids to help the eyeshadows stick on to the lids better and help the color show up better. I have darker eyelids, and I leave that as it is, but if you want to even out the skin tone a bit you can use a foundation or a concealer over the lids before applying the primer. 2. Apply a light peachy beige shade all over the lids with a flat eyeshadow brush (I have used Chanel #25). 3. Apply a deeper berry shade along the outer corner of the eye, keeping the color concentrated along the outer thirds of upper lashline and a bit into the crease. 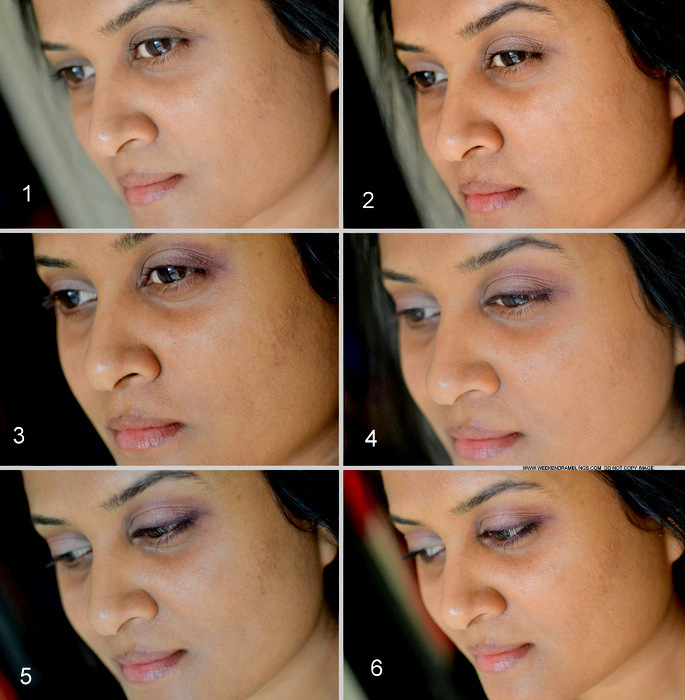 Blend the color softly using a fluffy eyeshadow blending brush (I have used the NARS #15 large dome brush). 4. Apply a thin line of a deep burgundy/berry eyeliner along the the upper lashline, keeping the line as thin as possible along the inner corner and thickening it just a little along the outer corner (have used MAC Dark Diversion). 5. Using a small smudging/blending brush (have used Chanel #14 contour shadow brush) and some of the dark berry shade used earlier, smudge the liner softly - the line should still be visible but much softer and not so defined. 6. Using whatever is remaining on the smudger brush, run some of the darker color along the outer thirds of the lower lashline. Also use the same dark eyeliner along the waterline. Curl lashes and finish with mascara. The eyeshadows I used had a bit of shimmer in them which caused some fallout apart from some more flying around while smudging, and I didn't bother with applying concealer until after my eye makeup was done. Clean up the undereye area with makeup wipes or makeup remover, and finish the rest of the makeup. Here's what I used. Concealers - Bobbi Brown Dark Peach Corrector along inner corner of the eye area. NARS Biscuit and Caramel* stick concealers to conceal undereye darkness and some blemishes. On lips, I used No.7 lipliner in Plum to lightly define lips and patted on MAC Hangup lipstick with my fingers like a tint. Benefit High Beam - it's a pale pink highlighter that blends into the skin like a dream. Josie Maran Berry Bliss Cheek Gelee - gel-like cream blush, leaves a berry flush that can be built up quite easily. What's been your go-to makeup look this week? Do share! Hey do you use Chanel Perfection Lumiere in BA34 now? I remember reading a review where you mentioned you used BA54 and I went out and bought it because we look like pretty much the same color :) Do you find that BA34 a better match? Hi Sarah! Yes, I did switch to 34 recently. I am not sure if it's the right match for my skin tone...seems like the undertone is a bit wrong..but it works okay in photos and I got a bottle so am sticking with it for now :P I have gone a bit lighter and a lot of my blemishes have cleared out (I still have quite few, but it is better), and BA54 was making me look very dark now which is why I have been trying out a lot of other foundation samplers, but not found one I am satisfied with so far. I tried BA44...looked too dark...then tried this one in store and it seemed perfectishhhh but back home and in daylight it seems a little dark. I am also planning to get a sampler of B40 some time and see how that works. For regular days (no photos), I just use Urban Decay Beauty Balm (zero coverage but gives a softer look to the skin) and use concealer on the blemishes. Long comment..but that's my foundation quest so far :D :D Among the foundations samples I tried so far, I didn't like anything as much as the Chanel Perfection Lumiere, though...the rest just didn't seem to blend into my skin the same.. I know what you mean - that foundation is ...well...perfection! I used to use Beige60 which was spot on before they upped the sunscreen and changed the formula late last year---that's when I tried out BA54. I still have a sample of Beige 60 which I hold on to for dear life - not sure why! Rabbit eyes!!! :D :D Lining with a darker eyeliner might help...works for me with a lot of the pink/pastel sort of colors.